My feet get cold easily and quickly in temperatures below about 10C / 50F, even with neoprene shoe covers over my Sidi Genius 5 Pro-Mega road shoes. On the recommendation of a cycling friend who uses them I bought a pair of Shimano SH-RW80s. 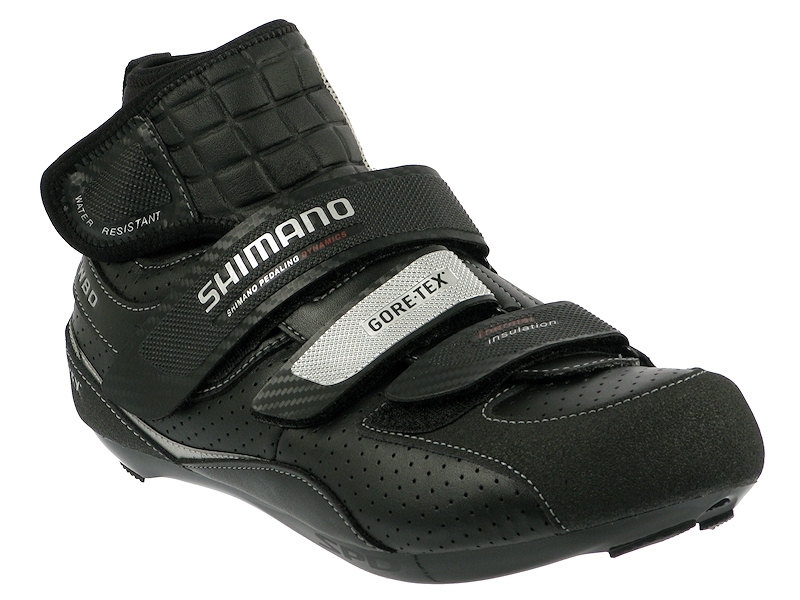 The first thing potential buyers must note is that these shoes run small in comparison to Sidi. I wear a 44 Sidi Genius 5 Pro-Mega. I wear a 46 Shimano SH-RW80. The size 46 provides plenty of room in the toe box for my wide feet and thick wool socks e.g. DeFeet Blaze. The three velcro straps over the front of the foot and the elastic neoprene ankle cover provide lots of room for adjustment once your foot is in the shoe. I have not experienced any tight spots / other uncomfortableness while wearing these shoes. There are two things to note when pulling these shoes on. The ankle cover tends to fold inward as you pull the shoe on, and the velcro hooks on the ankle cover catch on your sock. So you have to remember to hold that section of ankle cover away from your sock as you pull the shoe on. The insulated flap that sits over the top of your foot tends to get pushed to the outside of your foot as you pull the shoe on. Once your foot is in the shoe you have to pull the insulated flap back up and over your shoe. These shoes look more like boots than shoes. So they score very few points in the appearance department. However looks don’t keep your feet warm. These shoes are bulkier and longer than my road shoes. I had to position the cleats of my Speedplay pedals as far toward the inside edge of soles of these shoes as possible so that the inner heels would clear the chain stays on my bike. I was initially concerned that I would feel this change versus my road shoe cleat position in some adverse way, but that has not been the case. The Gore-Tex uppers, DURATHER liners, glass fiber soles and water resistant cuffs of these shoes do an excellent job of providing insulation and warmth. These shoes, together with thick wool socks, have kept my feet warm in temperatures down to about 5C / 40F. Together with neoprene shoe covers I have had warm feet in temperatures down to -10C / 14F or so. My rides have ranged between one and four hours long. I have ridden in some rain and on one occasion hail. These shoes did keep my feet dry. Other reviewers have commented about their feet getting wet in heavy rain and/or standing water. I haven’t ridden in really wet conditions so cannot comment. I have put about 1,500kms into these shoes. Apart from some very minor scuffing on the heels the shoes look as good as new. The reinforced heel and toe look sturdy enough to last for some years to come. The rubber inserts in the heel and toe are not replaceable, but they are not showing any wear yet. I use cleat covers when I walk in these shoes, which probably helps. I am very pleased with these shoes. They keep my feet warm in cold, wet and windy weather. Which is what I bought them for. Reflective flashes on heel and sides. Not the most stylish shoe. A bit finicky to pull on. Speedplay users must use the SPD adapter when fitting their cleats.